The creators of the newest Call of Duty are trying to turn the tide at E3 in Los Angeles this week. They’re up against a month-long sea surge of negativity the likes of which even this series has never seen. Working in their favour this week: what they’re showing of the new Call of Duty Infinite Warfare looks interesting. The world first saw Infinite Warfare on May 2 in the form of a trailer that’s since been downvoted on YouTube some 2.9 million times. Call of Duty has always had its hordes of fans and critics, but this was unusual. Fans seemed angered that the series, once set firmly in the past or in quasi-realistic modern times, was going to the sci-fi future for the second year in a row. Above: The notorious debut trailer. Let’s take the game first. You can’t play it at the show, but you can see it if you have an appointment to go to the upper floor in the Los Angeles Convention Center. Its publisher, Activision, has meeting rooms, including one that thunders with an Infinite Warfare demo every half hour. The theatre demo starts in Geneva, Switzerland. It’s supposedly the “near future”, as Horton dated it for me, though it seems further out, given the exo-skeletons worn by some of the game’s soldiers and the existence of large spaceships fighting throughout the solar system. 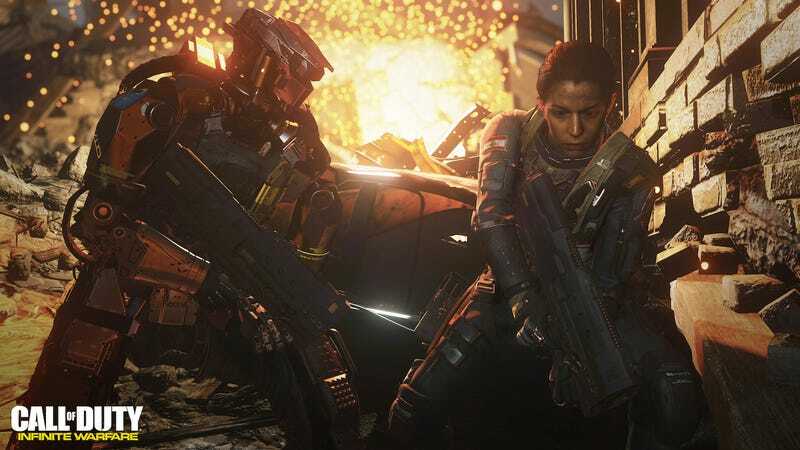 Infinite Warfare is, according to Horton, “a standalone story with a standalone cast of characters” that is not connected to the Modern Warfare games despite having the same studio, Infinity Ward, nominally behind both. In the demo, the player character is Captain Reyes, a top soldier who runs through the streets of Geneva as an invading force of human soldiers drops into the city from their invasion fleet out in orbit. Reyes shoots his way through the enemy forces. As he does, he moves past dazed civilians and briefly walks through a building filled with wounded, bleeding soldiers. Reyes fights for what remains of the United Nations Space Alliance, a multi-national military force that is trying to protect the earth from the malevolent Settlement Defense Front (SDF) and seems to be losing. The SDF, who are people, not aliens, don’t seem happy with the authorities on Earth and have flown their spaceships in to attack and invade the planet. The people promoting this game keep saying “boots on the ground,” likely to assuage the fans freaking out about Call of Duty turning into a space game. The people promoting this game keep saying “boots on the ground”, likely to assuage the fans freaking out about Call of Duty turning into a space game. (They were saying this from the time the trailer launched, a sign that they were likely anticipating some shock at the scenery shift.) Reyes does indeed run around, his boots on the ground, in the Geneva level. There’s some high-tech stuff mixed in with standard CoD shooting. He hacks into an enemy dropship and briefly assumes the perspective of a camera mounted on a robot or soldier in that ship before he blows it up. He calls in an air strike and a futuristic plane drops in and starts firing. Soon enough, though, boots are off the ground. Reyes gets into his own futuristic fighter jet of his own and decides it is time to fly it into outer space. As is standard for the franchise, all of this is in first person. At this point, the player gets a first-person view of flying through the sky over Geneva up through the blue of the atmosphere into the quiet black of space. Horton said that’s mostly a scripted moment, though players can move Reyes craft a little during the crackling-then-quiet ascent. Players can’t jet up into orbit at any time in a mission, though. Only once they are in space will they find more freedom. In space, the flight controls apparently open up. Space battles are not on rails. Players can fly in any direction, engaging enemy fighters and frigates. Reyes’s fighter, the Jackal, is like a person in Call of Duty. If it gets shot, it can fix itself. The idea here is to be able to engage in dogfights while flying in any direction. Space is Reyes’s newfound domain; in between missions, Reyes commands his own huge spaceship, the Retribution, which he was given command of during a battlefield promotion. The Retribution serves as a base of operations and a tarted-up mission select screen. On the bridge, players can activate a space map and decide to embark on main story missions or side missions. Above: The spectacular E3 space mission. One of those side missions was featured during Tuesday’s Sony PlayStation press conference. In it, Reyes flies the Jackal into enemy space, gets out of the craft and uses a grappling hook to pull himself onto the hull of a huge enemy ship. There, he has shoot-outs in zero-gravity before getting inside the ship, killing the crew and helping destroy it. Side missions like these, Horton explained, might give Reyes access to enemy into or to upgrades in technology that players would otherwise receive later in the campaign. That level looked fun to me, and seems to be going over better online, too, relatively speaking. Whereas the launch trailer is at 500k likes to nearly three-million dislikes, the demo of that level is at 43k thumbs up and 51k thumbs down. As interesting as the game was, I was even more interested in the experience the game’s developers had just gone through. Their game had made one of the worst debuts imaginable with that rampantly downvoted trailer on YouTube and I was curious how the team handled that. But as eager as they were to show Infinite Warfare at E3, I sensed reticence to discuss the palaver they’d just been through. After the demo and after I asked about a lot of the game’s nuts and bolts, I tried to engage Horton about that experience. I tried to get beyond hype and talking points. We sort of did. A little. Kotaku: Let’s talk about the trailer and the reaction to the trailer. Were you caught by surprise about how negative the reaction was? Brian Horton, art director on Infinite Warfare: Ultimately we’re just trying to make the best Call of Duty game we can. We have a very passionate fanbase. The concept of going to space was something the team felt an extreme amount of passion about. And just as with anything like this, when you’re talking about Call of Duty, that passion can spill over and some people might have different reactions. What we think we’re finding now is, the more people who get to see the game and see the kind of quality we’re putting into it, the passion we’re putting into it, we feel very confident that the Call of Duty fan is going to love what they get out of it. Kotaku: I agree with you that if you see more of it, it does look compelling and fun. Can you take me back to that day, though, when you guys put the trailer out? I’m sure there are always nerves, because the public hasn’t seen it before and they haven’t reacted. You’re hoping they’ll react well. What was that day like for you? Horton: You know, it’s a day like any other, ultimately. We want to launch the best product we possibly can. And at that point I think what it did is it steeled us to work that much harder on the game and make it as great as we possibly could. I think it was just a rally cry for us to keep pushing and stick to our guns and say, ‘yeah, we’re just going to make this game awesome,’ and that’s really what we had to do. We’re just heads down making the best game we can. Kotaku: Why do you think the reaction was so negative? So many downvotes on YouTube and everything? Horton: You know, it’s hard to speculate at this point. Kotaku: You’re telling me that it was basically a day like any other. But it wasn’t a day like any other. You got the most downvotes of any Call of Duty trailer ever, of any YouTube trailer ever. Horton: You know, the goal of the team always is: we can control the game that we’re making. Ultimately, when it comes to branding and marketing, that is another department. Our job is just make a great game. And like you said, there are points where you have these emotional reactions, and then you get back in the saddle and make a great game. That is all we have control of. We don’t have control of perceptions. We have control of the game. Kotaku: Had you been through that cycle before? Have you been attached to a project that, say, got a negative reaction before it came out and then when it finally came out people reacted really well to it? Had you been able to say, ‘oh, I know how this can go.’? Horton: I’ve been in the industry for 21 years and have had ups and downs throughout it. But ultimately when your team is clear and focused and you have a good idea and you work hard to achieve it, that is all that matters at the end of the day, the game you put out. And that’s really what the team wants to do is just prove it in the pudding. When you put the controller in their hand and you look at it on the screen, people are just like ‘This is awesome.’ It’s just binarily cool. And that’s what we’re getting to now. No matter what the context is, if it’s just cool and it plays well, people will come. The fans will come along.